The Socialist Viewpoint Publishing Association publishes Socialist Viewpoint in the interests of the working class. The editors take positions consistent with revolutionary Marxism. Within this context the editors will consider for publication articles, reviews or comments. The editors may publish comments to accompany these articles. Photographs and cartoons will be appreciated. Socialist Viewpoint reprints articles circulated on the Internet when we deem them of interest to our readers. Such articles are reprinted exactly as they appeared in the original source, without any editorial or stylistic changes by us. No limitation will be placed on the author(s) use of their material in their subsequent work provided acknowledgment is made of its publication in Socialist Viewpoint. The Socialist Viewpoint Publishing Association retains for itself rights to reprint articles as collections, educational bulletins, and similar uses. With the inclusion of an acknowledgment and a notice of the copyright ownership, permission is hereby given educators to duplicate essays for distribution gratis or for use in the classroom at cost. The author(s) retain all other rights. Signed articles do not necessarily represent the views of Socialist Viewpoint. These views are expressed in editorials. Socialist Viewpoint is printed by members of Local 583, Allied Printing Trades Council, San Francisco, California. 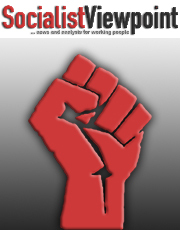 Socialist Viewpoint magazine has been edited and distributed by a group of revolutionaries who share a common political outlook stemming from the old Socialist Workers Party of James P. Cannon, and Socialist Action from 1984 through 1999. What we have found is that our numbers are insufficient for this crucial project of party building. This problem is not ours alone; it is a problem flowing from the division and fragmentation that has plagued the revolutionary movement in capitalist America and the world since the 1980s. What we intend to do is to continue to promote the idea of building a revolutionary Marxist working class political party through the pages of Socialist Viewpoint magazine. We continue to have an optimistic outlook about the revolutionary potential of the world working class to rule society in its own name�socialism. We are optimistic that the working class, united across borders, and acting in its own class interests can solve the devastating crises of war, poverty, oppression, and environmental destruction that capitalism is responsible for. We expect that revolutionaries from many different organizations, traditions, and backgrounds will respond to the opportunities that will arise, as workers resist the attacks of the capitalist system and government, to build a new revolutionary political party. Just as we join with others to build every response to war and oppression, we look forward to joining with others in the most important work of building a new mass revolutionary socialist workers� party as it becomes possible to do so. Please label your article as a submission in your subject line. You can attach a word document as well as post the text of your article in the body of your email. By the second week of December for the January/February issue. By the second week of February for the March/April issue. By the second week of April for the Sep/Octe issue. By the second week of June for the July/August issue. By the second week of August for the September/October issue. By the second week of October for the November/December issue.